AVID Jazz here presents four classic Modern Jazz Quartet and John Lewis albums, including original LP liner notes on a finely re-mastered and low priced double CD. 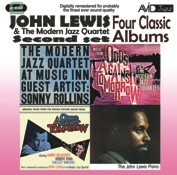 The Modern Jazz Quartet At Music Inn - Vol Two, Music From Odds Against Tomorrow,  The John Lewis Piano and the Original Music from the soundtrack to Odds Against Tomorrow. It has taken us a while to release the follow up to our first Music Inn date (AMSC945) but the waiting is over and here it is complete with the great tenor man Sonny Rollins on two tracks Bags Groove and Night In Tunisia! We also include two different takes on the music John Lewis composed for the movie Odds Against Tomorrow the second film score of Lewis that we have featured in this series, the other being No Sun In Venice (AMSC976). The soundtrack features the MJQ along with a full orchestra and includes such classic jazz names as Bill Evans, Jim Hall and Gunther Schuller and is conducted by none other than John Lewis himself. The music from the film is presented by the MJQ alone, both were recorded in 1959. We have divided these two takes with the first album devoted primarily to the solo piano of John Lewis The John Lewis Piano. Here the great man is joined by a small and select group of musicians, Connie Kay and Percy Heath and on guitar on four separate pieces, Barry Galbraith and Jim Hall.